Many visitors to Egypt explore the enchanting beaches of Sinai, the history of Luxor or the vastness of the Western Desert; however, the true magnificence of Egypt lies in the unknown treasures hidden in every single city—even such an average one as Al Minya. 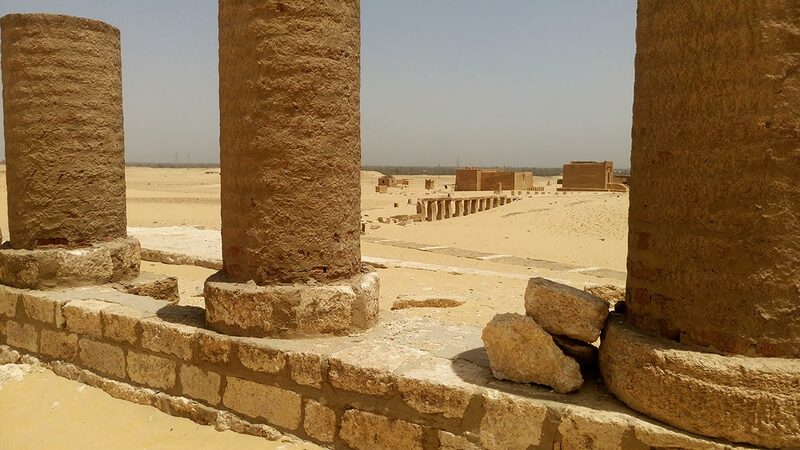 A three-hour drive south of Cairo, Al Minya is considered a city of the south by northerners, but if you talk to any authentic southerner, he will deny that Al Minya is part of their heritage. Southern Egyptian cities tend to be much more conservative, with their own unique cultural heritage that northern urbanites tend to know little about—to us Cairians, we view the south as one lump of very stagnanttraditions. We tend to be unaware that the farther south one travels, the more traditions tend to tie with our pharaonic heritage. Each town intertwines its own conservative beliefs into what once was ancient. 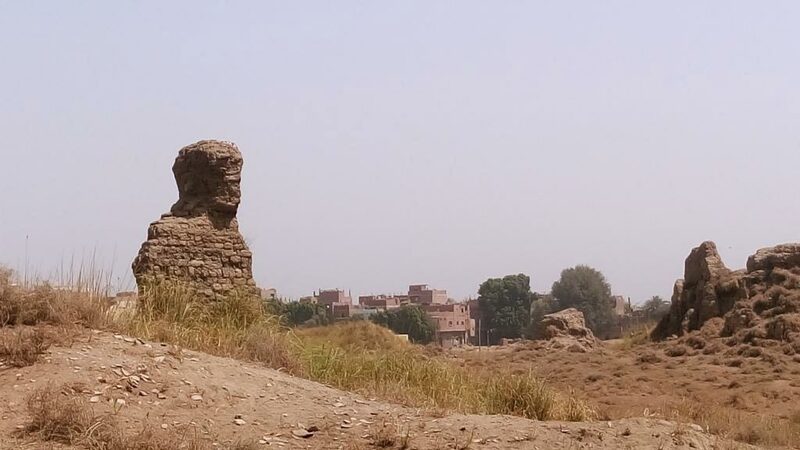 When my friends and I noticed an organized trip by Cairo Hiking, marketed toward local Egyptians, that promised to show us an in-depth view of Al Minya, we were quickly intrigued. We didn’t know anything about the city’s tourist side, so we packed our bags and joined. Our bus left Cairo at around 2:00 a.m., and we arrived at our destination half asleep 5:00 a.m. to enjoy the sun rise along the banks of the wide Nile, surrounded by greenery on both sides. We ate our breakfast at a docked Nile cruise ship, but I recommend anyone else opt for a traditional plate of fool (fava beans) and falafel from any local restaurant. Our first stop was Beni Hassan, about 20 kilometres south of the city centre. While the name may sound modern to Arabic natives, the place is actually a Pharaonic burial site from the middle kingdom in the 21st century B.C. Most ancient tombs tended to be underground, yet as we explored the historic areas around Al Minya, we found many here carved into the mountains. Beni Hassan, an Arabic name meaning “sons of Hassan,” hosts around 39 burial tombs, only four of which are open to the public. It is believed that tombs on the upper ends of the cliff are of the Nobles, while the tombs of the lesser-ranked pharaohs were carved on a lower altitude. As the four accessible tombs were for nobles, we could not really compare the difference between average tombs and those carved for the elite. 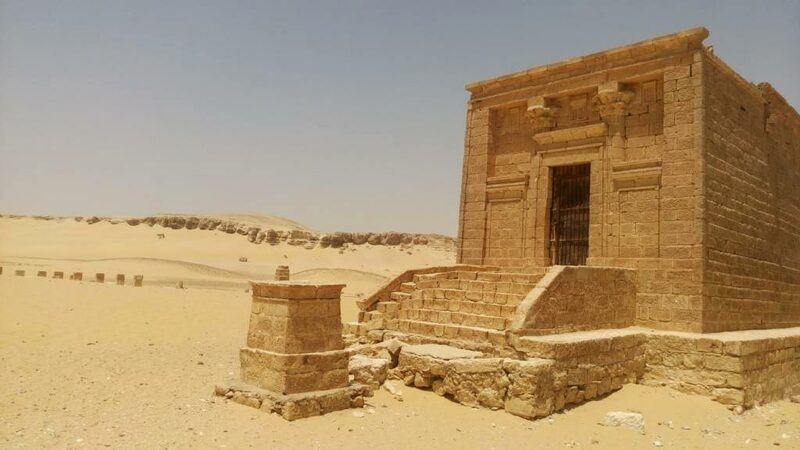 As opposed to tombs in Luxor, Edfu or Suhaj, those in Beni Hassan appeared modest, mostly composed of one main room with a shaft leading to an underground smaller room where the mummy was stored. The tomb of Isadora, daughter to a famous Roman emperor. Nevertheless, the wall art and its messages were amazing, vividly explaining ancient disciplines such as wrestling, meditation and healing. While photographing ancient temples and tombs has been banned for some time, as cameras’ flash bulbs may affect the tomb’s natural colours, the government has allowed non-flash photography for an EGP 300 ticket (about CAD$20). Beyond the history of these mountains, nothing can compare to their magical view of Al Minya. Looking ahead you can see the Nile as it curves and turns, carving its way up north, flanked by rows of green fields and palm trees. While everyone else sat inside one of the ancient tombs listening to our guide lay out wealth of history, I sat outside alone with my thoughts absorbing the view. It occurred to me that another Egyptian, at some point in the ancient past, sat right here, where I was now getting lost, maybe losing himself in the same view and thinking about life. It’s moments like these that make me stop and consider our unique heritage within humanity. Climbing down a hundred or so stairs to reach our bus, we headed on to our next stop—the cave where the Virgin Mary hid in for three days. Located on the east bank about 40 kilometres north of Al Minya’s city centre, The place has several names, the most famous of which is Gabal el Teir (Mountain of Birds), as thousands of migrating birds are believed to stop by the surrounding mountain. Wall art inside the priest’s tomb. Similar to the ancient tombs, the monastery was hewn into mountains to surround the cave around 300 years after the Virgin Mary passed by Egypt. Historians claim that the mother of the Emperor Constantine, Empress Helena, ordered the construction of the church in memory of the journey of the holy family. There are two ways to reach the monastery from the main road, either by climbing 166 steps or via car. The beauty of the stairs is the view you get to enjoy climbing up; nevertheless, we opted for the more convenient road leading up to the gates of the monastery. As we walked toward the gates we were surrounded by traditional Egyptian-style cemetery houses. In Egypt, every family has a private cemetery, which is either surrounded by walls with no ceiling or built like a one-storey house. This part of Egypt’s heritage is believed to have evolved from the ancient pharaonic tombs. Out of respect for the sanctity of the place, all visitors must take off their shoes, which are kept on shelves by the door. The church is modest in design, yet you can feel the energy from its doors. As you enter the small grey cave, an overwhelming sense of calmness overwhelms you and your thoughts slow down. It is a feeling that can only be felt rather than described. We were greeted by the church priest, who offered to answer all our questions and walked us through the history of the magnificent church. A few buildings surround the church: a modern one where the nuns and priests rest; a little café to buy a much-needed coffee; and a small room, dubbed a library, where you can buy tokens, rosaries and a cold drink. While the heat was unbearable, we took our time to enjoy the view from the side of the church as we sipped our coffee. I took the opportunity to briefly chat with a little girl who was selling hats in front of the monastery. Despite the heat and lack of customers, she was very cheerful and interested in chatting up visitors. We began to head farther away from the city centre, driving around an hour and a half into the nearby town of Mallawi to reach the ruins of the ancient city of Ashmunein—or, as it’s called in Greek, Hermopolis. Ancient Romans believed that the very first sun rose above this city, marking the creation of the world. The city was original guarded by two giant baboon statues, believed to belong to the god Thoth. The baboons were later moved closer to the main road, and placed away from the ruins. Yes, young girls will try to sell you things, but they’re also happy to chat. As we reached the main ruins, we were greeted with groups of children from the nearby rural town. We were advised not to be too friendly with the children as they mainly bother tourists for tips—while it turned out to be true, the children were still delightful to talk to. The remaining ruins were spread in clusters, a hundred metres or so apart. At the centre were Roman-style columns, a little to the left of which was a giant baboon face standing above a crumbled wall. We only spent about 30 minutes or so at Ashmunein, before moving on to Tuna el-Gebel (Tuna the Mountain), the resting place of Isadora, the daughter of the Roman emperor Antoninus Pius, from the second century A.D. 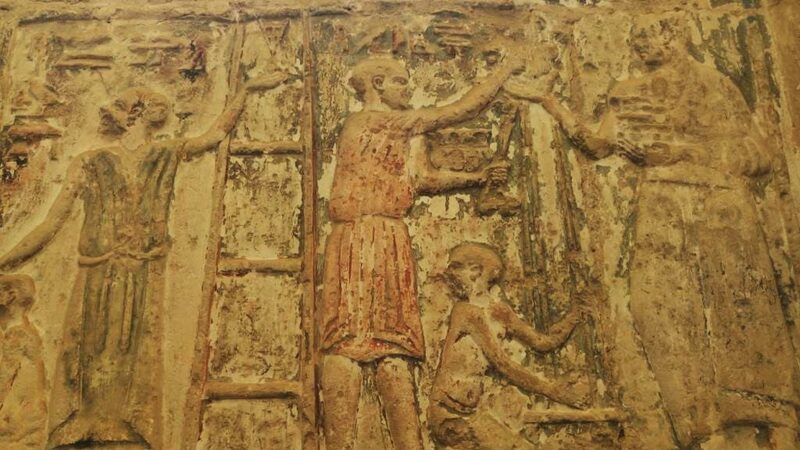 The place also hosts the tomb of the high priest of Petosiris who lived around 350 B.C. Although from the outside they resemble an average ancient Egyptian tomb, the internal carvings are nothing but. The internal carvings show clearly Roman faces and attire. The stories depicted are very vivid with colours still well preserved despite the harsh heat surrounding the tombs. One of the true treasures of the place was an underground burial site for thousands of sacred animals. As you walk downstairs you discover corridors upon corridors, each dotted with holes. While currently emptied, these holes used to hold mummified baboons and birds, like a gallery. 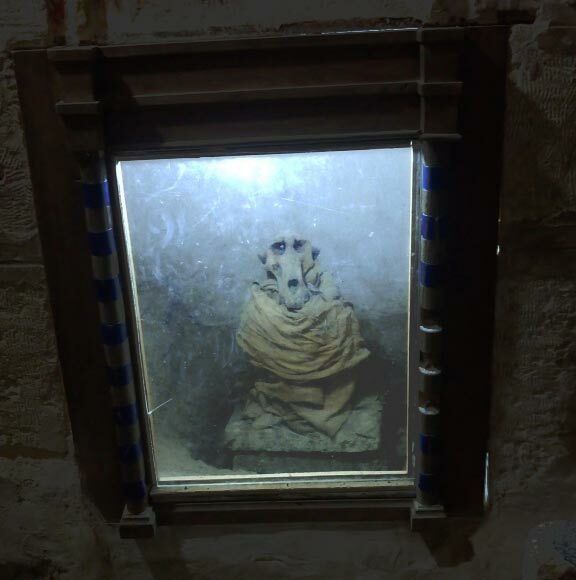 One of the corridors lead to a room with the shrine of the god Thoth in his living image, a mummified baboon next to its statue. Editor’s note: a mummified baboon is a terrifying thing. 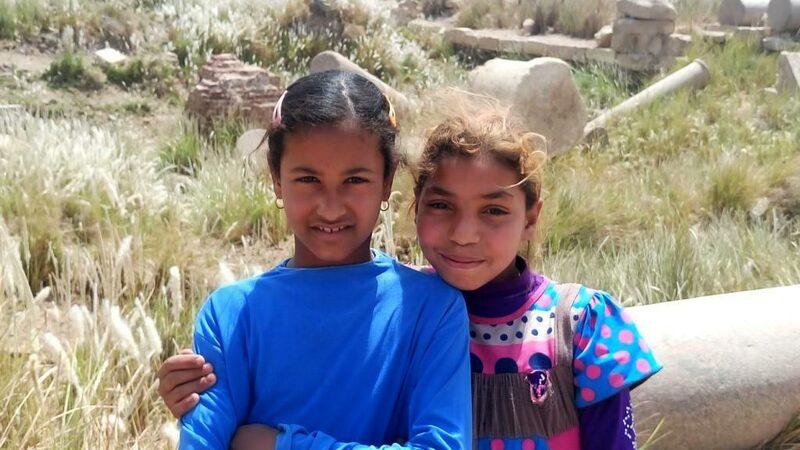 By 2 p.m. the heat was nearly unbearable, and we quickly moved to our last stop, Tell el-Amarna, which translates to the hill of Amarna—a reference to Beni Amran, the tribe that lived in the area. Located around 60 kilometres from Al Minya’s city centre, the pharaoh Akhenaten chose this area as the spot for his new capital city. Legend has it that he chose this spot because the sun rises exactly between two hills, representing the power of the god Aten. Today it is little more than a patch of white desert, since construction was abandoned after Akhenaten passed away and his son moved the capital back to Thebes—what we now call Luxor. We can get a glimpse into what might have been, however, by seeing the remnants of tombs and temples that still stand. To close our trip, we enjoyed a wonderful meal in the middle of an open field on the outskirts of Al Minya. Whether you are in the delta or at the farthest southern point in Egypt, you haven’t experienced the country until you’ve sat in an open field enjoying a traditional meal of feteer, old fermented cheese and molasses. We enjoyed one final delicious treat in our last hour—while my friends and I waited for everyone to finish their lunch, we found a small hookah spot, sat under a tree, right by the Nile, chatted and enjoyed some shisha. Even though I rarely smoke, it was a perfect ending to a long day. While most attractions are on the outskirts of Al Minya, if you plan to stay overnight, aim for one of the handful of hotels in the city centre. Amenities and level of service tend to dwindle as you move away from the main streets. For transportation, within the city centre, a taxi will do—an average ride will only cost around EGP 10 (less than CAD$1). For all the places mentioned above, you need to arrange a car or tour operator. Try to visit the tourist sites after 8:30 a.m., so not to waste time waiting for the temple and tomb guards to show up with the keys. For the monastery, try to go after 11:30 p.m. out of respect for their mass, which ends shortly before then. Lastly, remember that Al Minya is a pretty conservative place. While female visitors are not required to wear headscarves, they are expected to at least dress modestly and not walk the streets unaccompanied. Nadine is a Cairo-based writer exploring a tiny spec of the universe. She has 10 years of editorial experience, has been published in several industries and holds a master's degree in marketing.